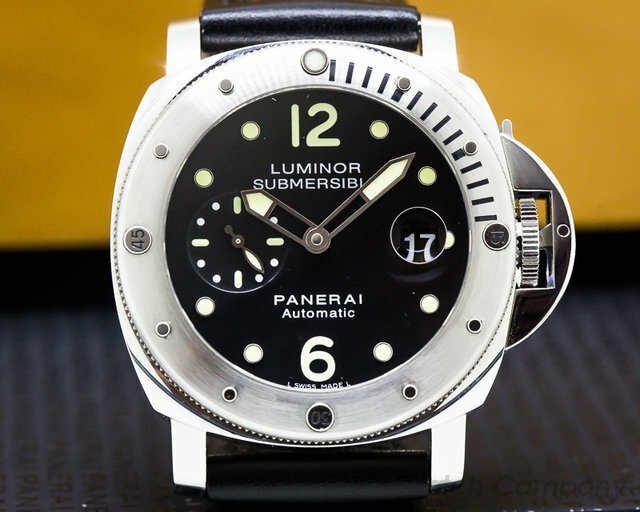 Recently Sold Watches at European Watch Co.
31165 Panerai PAM 24 Luminor Submersible PAM00024 PAM24, Limited to 1500 Pieces, stainless steel case on a leather strap with a tang buckle, automatic movement, black dial with applied luminous hour markers, luminous hands, date at 3 o'clock, recessed small seconds at 9 o'clock, sapphire crystal, water resistant to 300 meters, diameter: 44mm, thickness: 15.5mm. 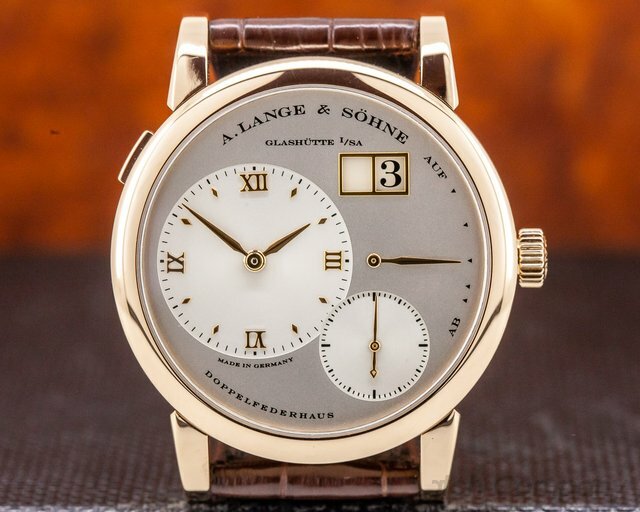 Like New with original box and papers dated December 2016. 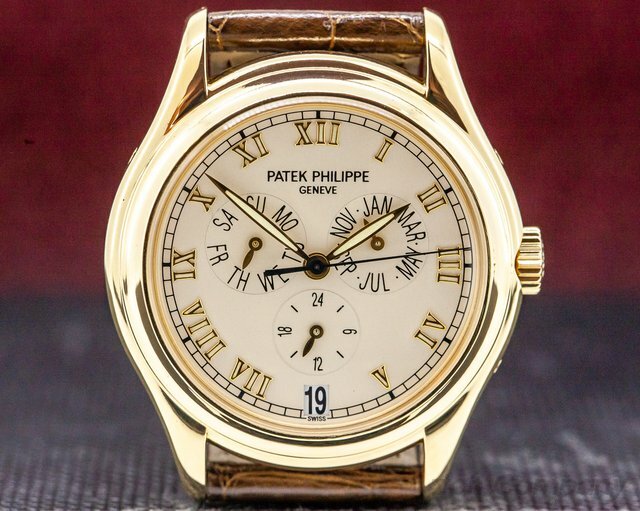 31173 Patek Philippe 5035 J Annual Calendar, 5035J-001, 18k yellow gold on a strap with an 18k yellow gold buckle, automatic Patek Philippe Caliber 315S QUA Movement, annual calendar (day, date, Month), 24 hour indicator at 6 o'clock, diameter: 37 mm, thickness: 11 mm, display back, sapphire crystal, water resistant to 2.5 atm, like new with Patek box and original papers, dated May 1998. 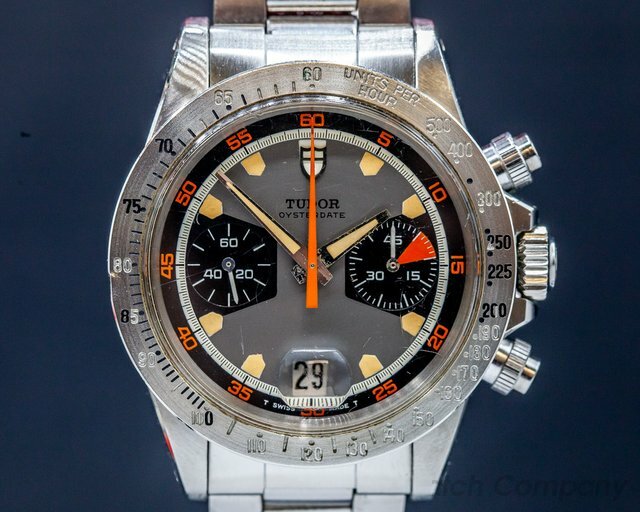 31183 Tudor 7032/0 Vintage "Home Plate" Chronograph 7032, stainless steel on a stainless steel folded-link 7836 Rolex Oyster bracelet stamped 1970 with 280 end-links, the stainless steel case appears to be unpolished, manual-wind Valjoux 7734 movement, grey dial with black subdials, orange accents, distinctive "home plate" hour markers, the luminous on the dial and hands are incredibly clean, bright and original, date with cyclops at 6 o'clock, chronograph, screw-down Oyster crown and pushers, early MK1 pushers, acrylic crystal, fixed external tachymeter bezel, original dial and hands, 756XXX serial number (circa 1971), diameter: 40mm, thickness: 13mm. 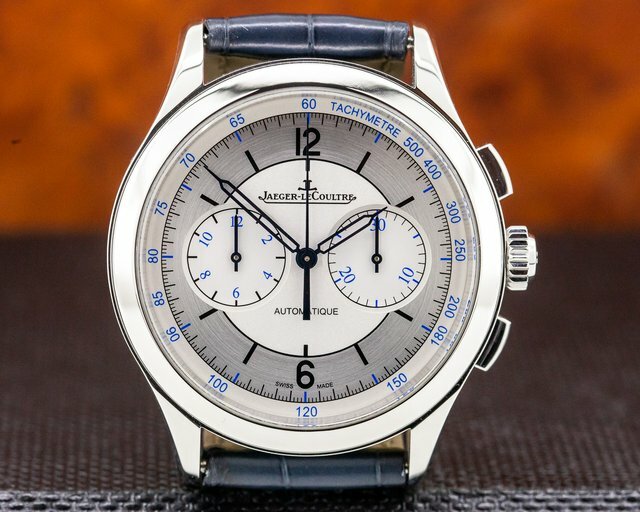 This is an extremely rare watch from the first year of production and is in excellent original condition with European Watch Company pouch and 6-month warranty. 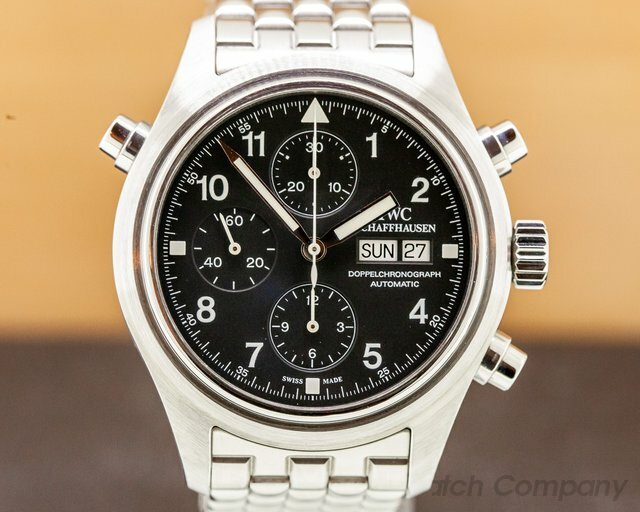 The watch was purchased from the descendant of the original owner. 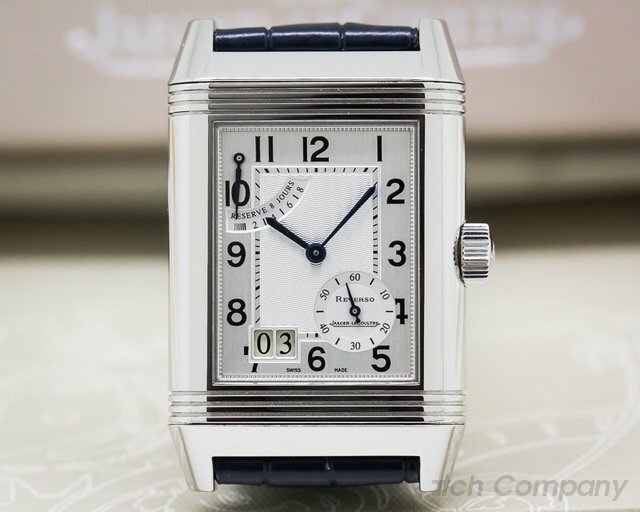 30775 Jaeger LeCoultre Q3758420 Reverso Grande Calendar 375.84.20 3758420, stainless steel on a strap with a stainless steel double-rold over buckle, manual wind JLC Caliber 843 movement, 45 hour power reserve, moon phase, date, day and month windows, silver textured dial, sapphire crystal, water resistant, display back, size: 30mm x 48.5mm, thickness: 10.4mm, Like new with original box and instruction booklet. 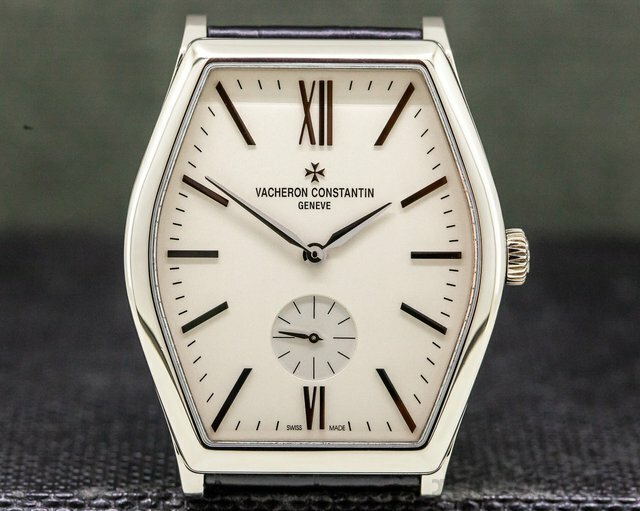 31404 Cartier WE902063, Ballon Bleu Medium, Reference: WE902063, 18k rose Ggld on a 18k rose gold tank buckle, automatic movement, iilver opaline dial with diamond markers and blued steel hands, centered sweep second hand, fluted crown set with synthetic cabochon-shaped Spinel, diameter: 33 mm, thickness: 9.9 mm, domed sapphire crystal, water resistant to 30 meters, new with box and papers. 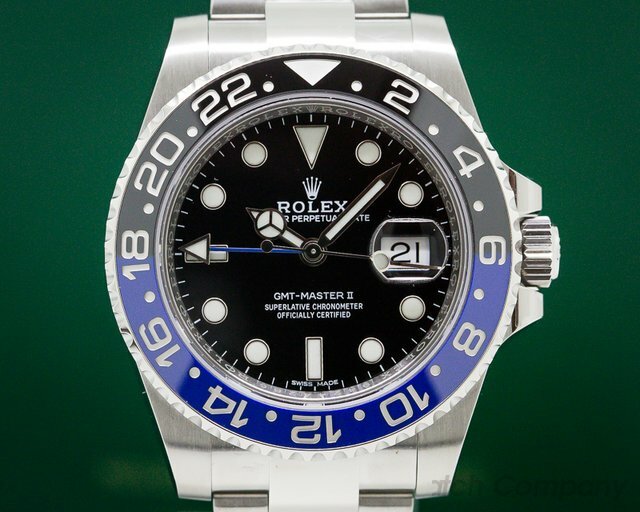 31222 Rolex 116710 GMT Master II, 116710BLNR, 116710 BLNR, stainless steel case on a stainless steel bracelet, automatic, date, second time zone, 24-hour hand, COSC, black dial, black and blue ceramic bezel, sapphire crystal, water resistant to 100 meters, scrambled serial, diameter: 40mm, thickness: 12mm. 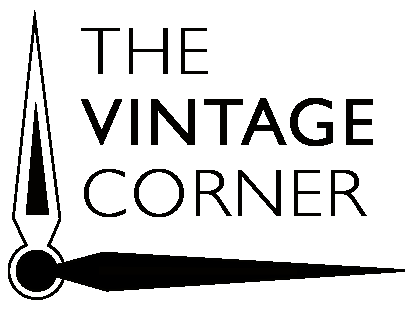 Unworn with original box and papers from March 2019. 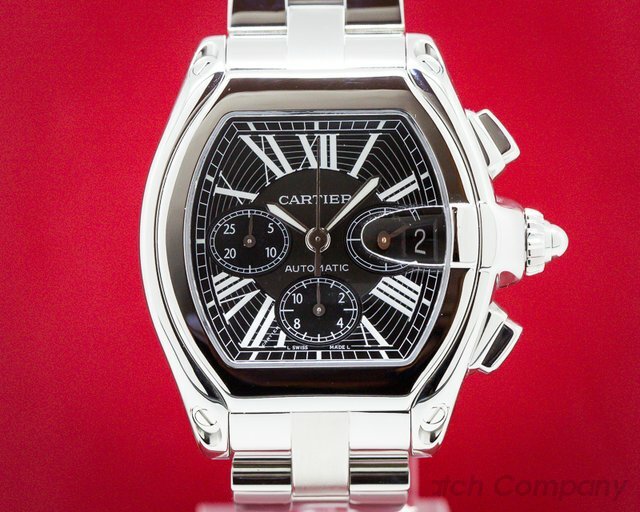 30713 Cartier W62020X6 Roadster Chronograph XL, stainless steel on a stainless steel bracelet, chronograph, date, small seconds at 3 O'clock, tachymeter scale, screw-down crown, luminescent hands, black dial with white oman numerals, sapphire crystal, water resistant to 330ft, diameter: 43mm, thickness: 13mm, Like New with Original Box and Papers dated 7/2006. 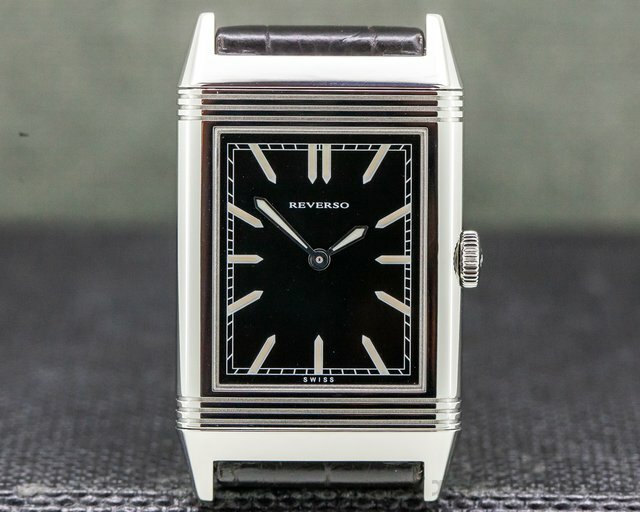 This watch was just completely serviced. 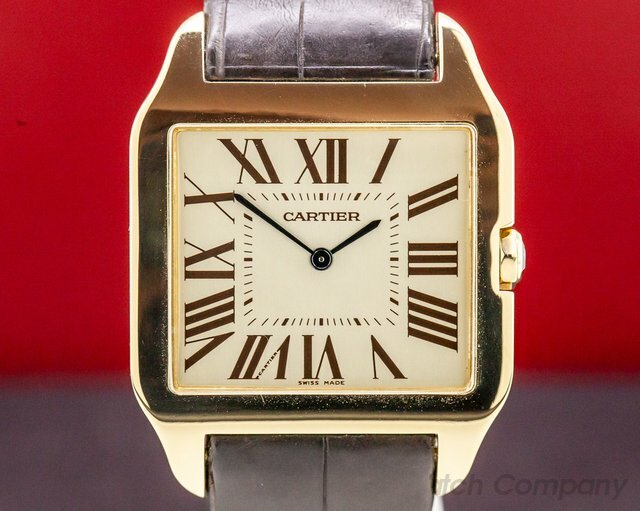 31250 Cartier Santos Dumont W2006851, 18K yellow gold on a strap with a 18K yellow gold deployment buckle, mechanical manual wind movement, size: 35mm x 44.2mm, thickness: 5.5mm, dark brown roman numerals, sapphire crystal, water resistant, like new with original box and papers dated December 2004. 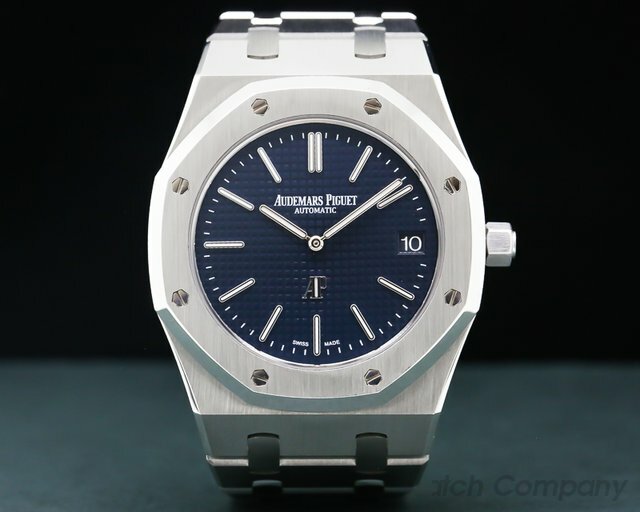 30758 Audemars Piguet 15202ST.OO.1240ST.01 Royal Oak Extra Thin, 15202STOO1240ST01, stainless steel on a stainless steel bracelet, automatic Audemars Piguet caliber 2121 ultra thin movement, date, blue "Petite Tapisserie" dial with applied baton hour markers, luminescent hands and indexes, display back, sapphire crystal, water resistant, diameter: 39mm, thickness: 8mm, Like New with Original Box and Papers, dated December 2015. 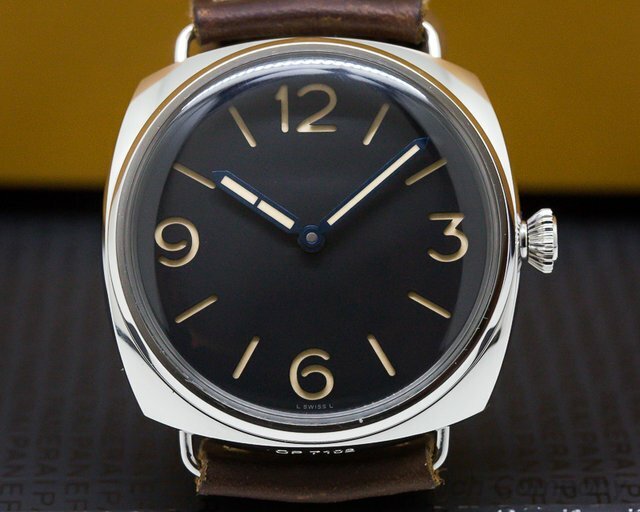 31054 Panerai PAM 320 Luminor 1950 3 Days GMT, PAM00320, PAM320, limited edition of 2500 pieces, stainless steel on a rubber strap with a stainless steel buckle, Panerai P9001 caliber, automatic movement, 3 days power reserve, date at 3 o'clock, COSC, small seconds indicator at 9, black dial with luminous numerals and hour markers, baton hour and minute hands, sapphire crystal, water resistant to 100 meters, diameter: 44mm, thickness: 18mm, like new with original box, strap changing tool and papers, dated October 2013. 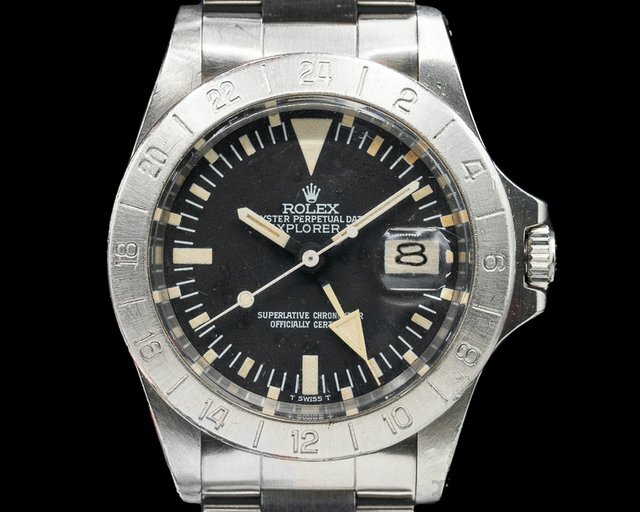 30409 Rolex 1655 Steve McQueen Explorer II "Albino" 24 Hour Hand, stainless steel case on a stainless steel Oyster bracelet (78360) with #501B end links, case is in excellent condition, automatic movement, original dial is in excellent condition with very clean and even patina, the luminous material on the watch is unaltered, iconic "albino" 24 hour hand that has aged from bright orange to a very light yellow, 24 hour hand serves as AM / PM indicator, acrylic crystal, screw down crown, 382XXXX (1974), diameter: 39mm, thickness: 13.5mm. 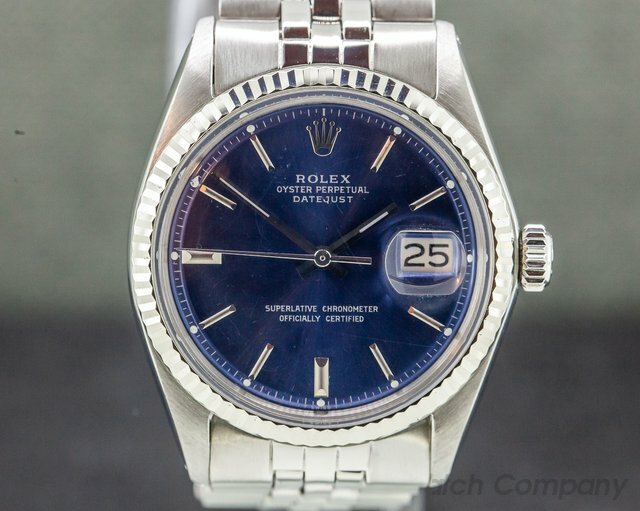 Excellent Condition with Rolex box and Rolex service guarantee from June of 1995. 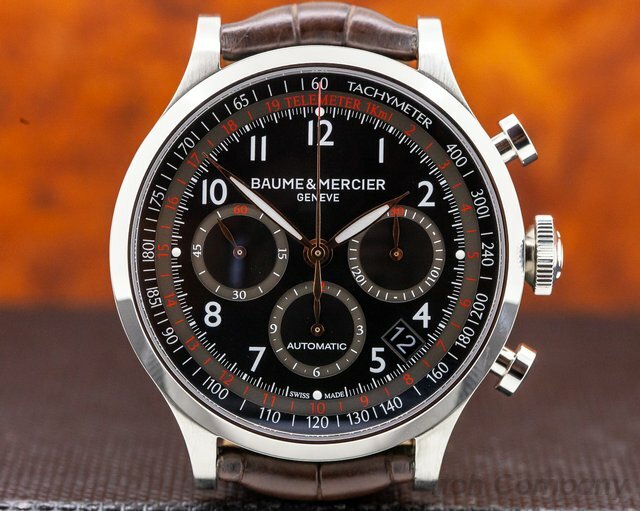 30963 Baume & Mercier, Capeland Chronograph 44, M0A10067, Stainless Steel on a leather strap with stainless steel deployant buckle, automatic movement, date, chronograph, small seconds at 9 o'clock, date at 4 o'clock, black dial with red telemeter scale, luminescent rose gold hands and Arabic numerals, diameter: 44mm, Thickness: 14.9mm, sapphire crystal, water Resistant to 50 Meters. 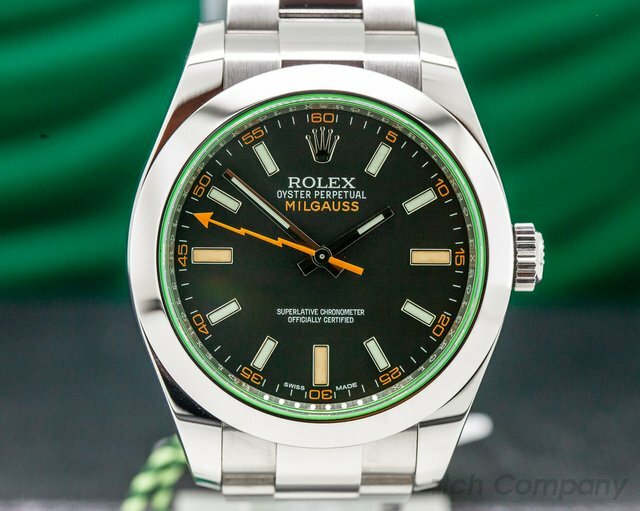 Like new with original box and open papers. 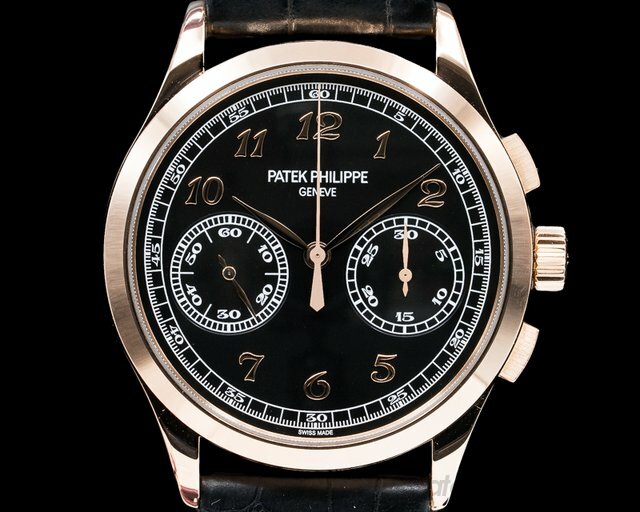 31394 Patek Philippe 5320G Perpetual Calendar Grande Complication, 18k white gold case on an alligator strap with an 18k white gold Patek Philippe deployment buckle, automatic Patek Philippe caliber 324SQ movement, perpetual calendar with day and month windows at 12 o'clock, moonphase and pointer date at 6 o'clock, small round windows for the leap year and day/night indicator, 48 hour power reserve, cream colored laquered dial with applied luminous white gold Arabic numerals, luminous syringe hands, central sweep seconds hand, sapphire crystal, water resistant, diameter: 40mm, thickness: 11mm, Unworn with original winding box, setting pin, solid case back and papers; dated 1/2019. 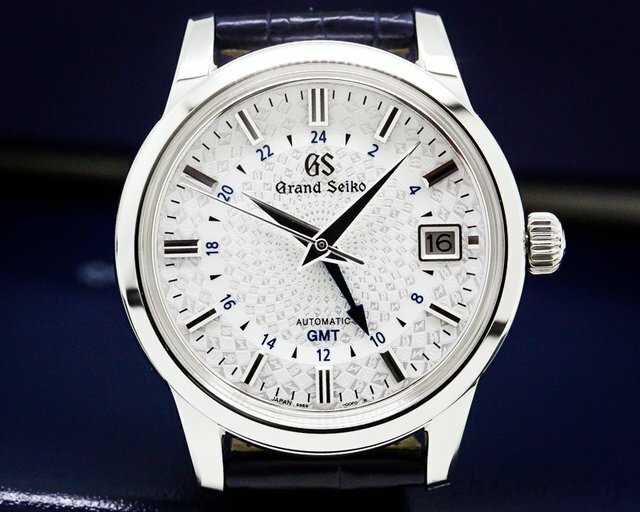 31171 Grand Seiko Elegance SBGM235, Limited Edition of 1000 pieces to celebrate the 20th anniversary of the Seiko Caliber 9S movement, stainless steel on a strap with a stainless steel deployant buckle, automatic Grand Seiko caliber 9S66 movement, silver guilloche dial with applied hour markers, dauphine shaped hands, blued steel GMT hand, center sweep seconds hand, date window at 3 o'clock, water resistant to 100 meters, diameter: 39.5mm, thickness: 13.5mm. 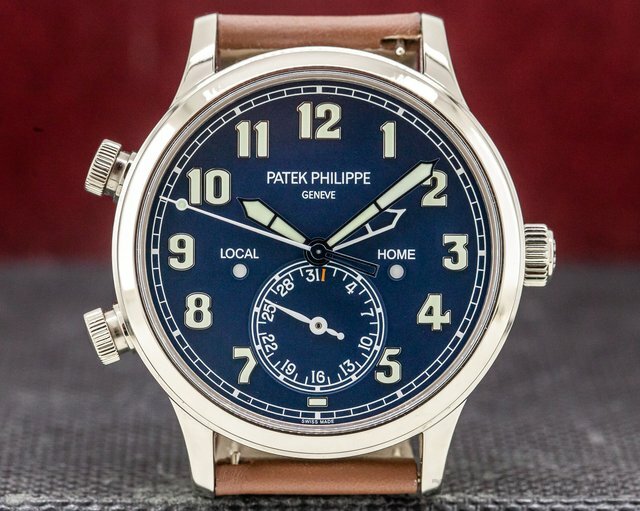 Like New with original box, booklets, additional strap, and papers dated January of 2019. 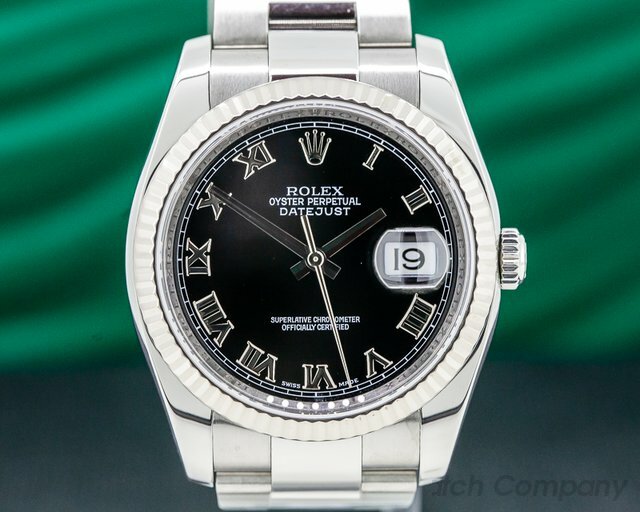 30679 Rolex 116234 Oyster Perpetual Datejust, stainless steel on a stainless steel oyster bracelet, 18k white gold fluted bezel, automatic Rolex caliber 3135 movement, date window at 3 o'clock, black dial with applied Roman numeral hour markers, COSC, sapphire crystal, water resistant, diameter: 36 mm, thickness: 12mm, D series (2005), Like New with Box and Booklets. 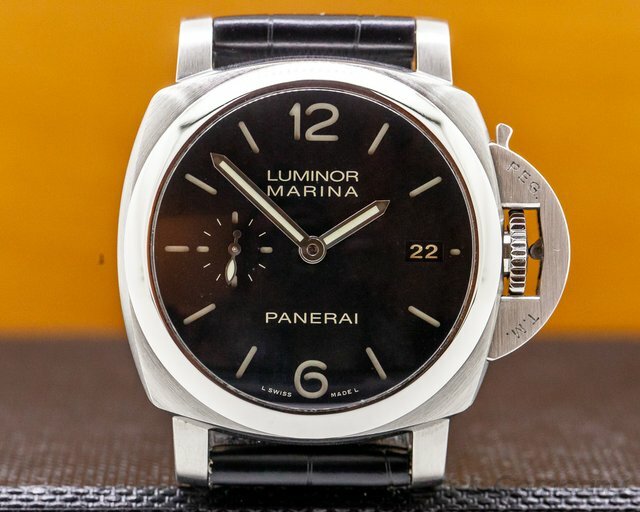 30941 Panerai PAM 392 Luminor Marina 1950 Automatic PAM392, limited edition of 1500 pieces, stainless steel on a strap with a stainless steel tang buckle, automatic Panerai caliber P.9000, black sandwich dial with luminous hour markers, luminous date at 3 o'clock, sub seconds at 9 o'clock, sapphire crystal, R Series (2015), water resistant to 100 meters, diameter: 42MM, thickness: 16MM, Like new with original Box, Strap Changing Tools, and Papers; dated June 2015. 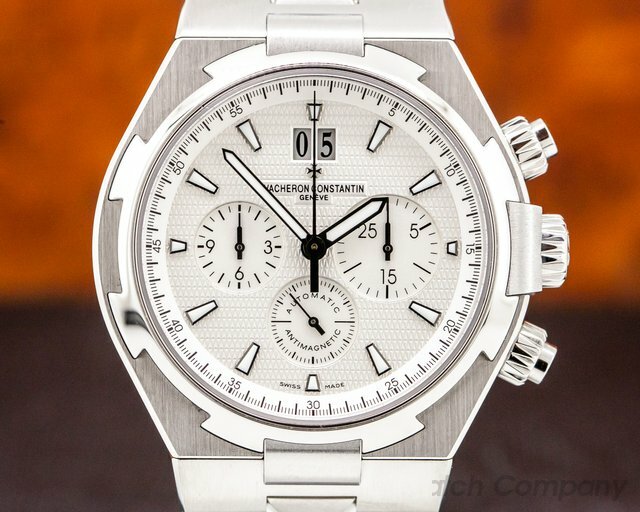 30686 Vacheron & Constantin 5500V Overseas Chronograph 5500V/110A-B075, 5500V110AB075, stainless steel on a stainless steel bracelet, automatic antimagnetic VC caliber 5200 movement, 12-hour chronograph, silver dial with luminous hands & hour markers, date between 3 and 5 o'clock, small seconds at 9 o'clock, sapphire crystal, display back, water resistant to 150 meters, diameter: 42.5mm, thickness: 13.7mm. 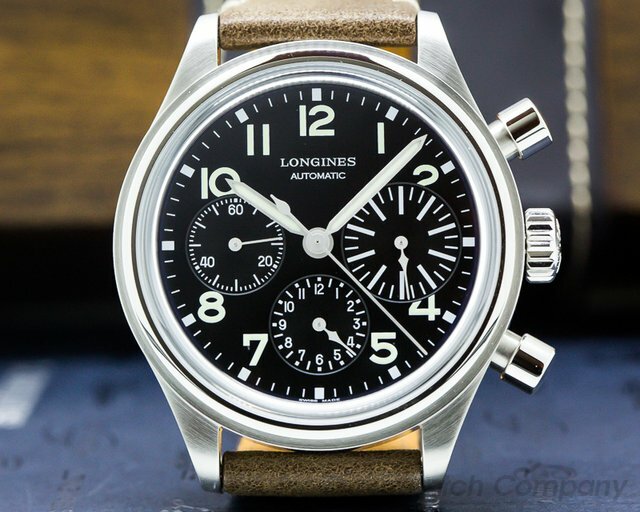 Like New with original box, booklets, additional rubber and alligator straps, stainless steel deployant buckle, and papers which are not dated. 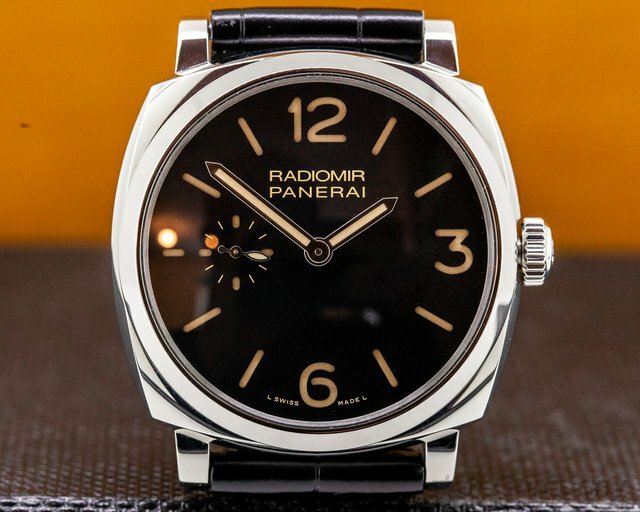 31231 Panerai PAM 00512 Radiomir manual wind, PAM00512, stainless steel on a strap with a stainless steel tang buckle, Panerai in-house manual wind movement, black sandwich dial with luminous index and Arabic numeral and hour markers, sapphire crystal, water resistant to 100 meters, diameter: 42mm, thickness: 13.7mm. 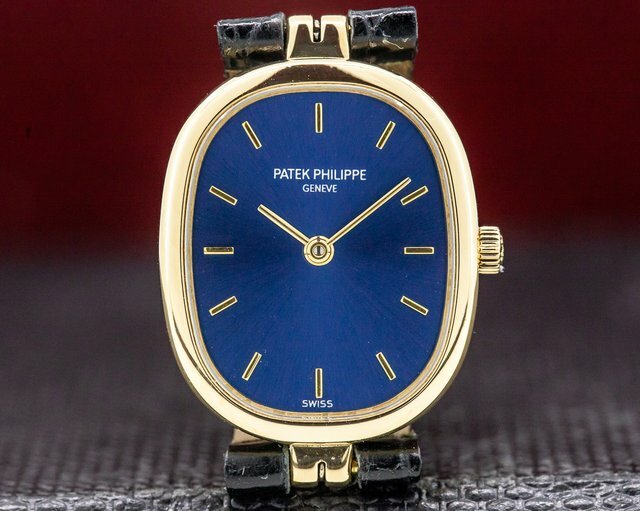 Like New with original box and papers. 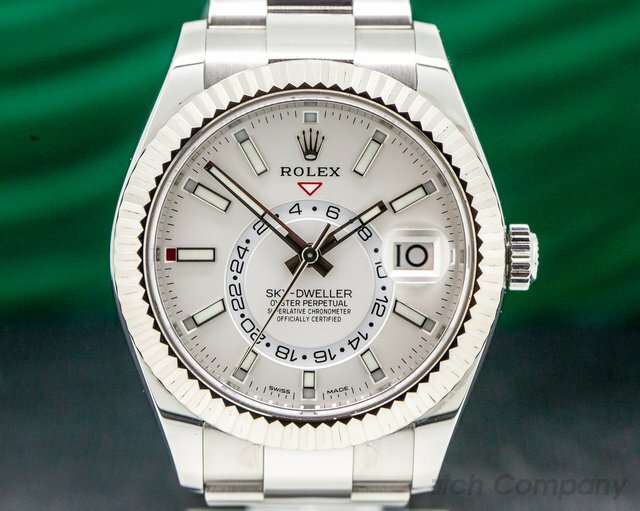 31240 Rolex 326934 Sky Dweller, stainless steel on a stainless steel oyster bracet, automatic Rolex caliber 9001, COSC, 18k white gold rotatable command bezel, GMT located in center of dial, 72-hour power reserve, white dial with applied luminous hour markers, date at 3 o'clock, red indicator on outer minute track indicates the month, size: 42mm, thickness: 14.5mm, water resistant to 100M, sapphire crystal. 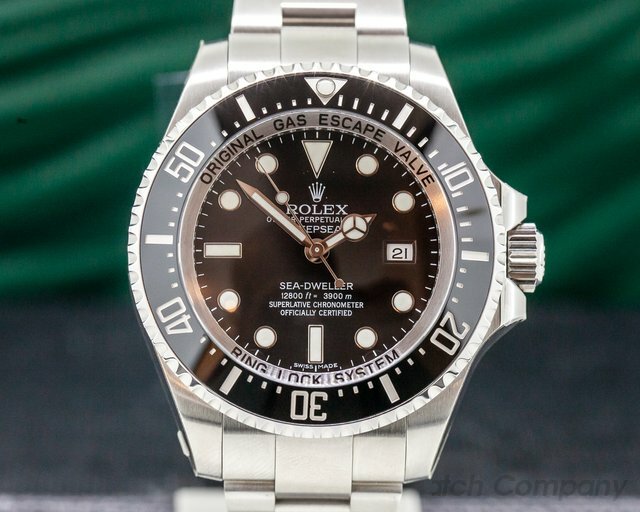 like new with original box and papers dated December of 2018. 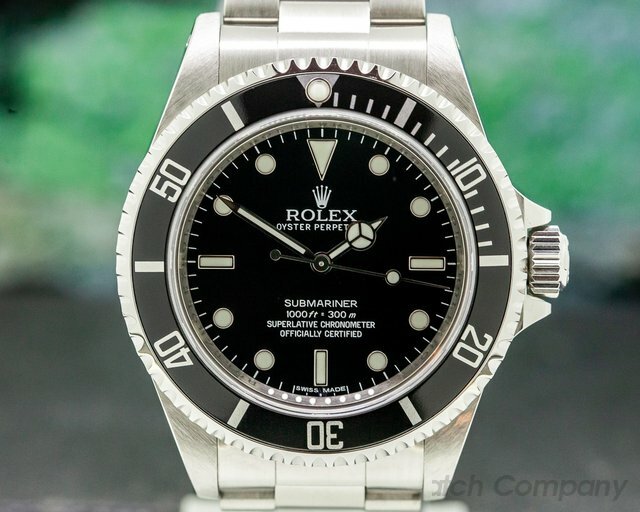 31245 Rolex 116660 Sea Dweller Deep Sea, barely worn, original stickers still in place. 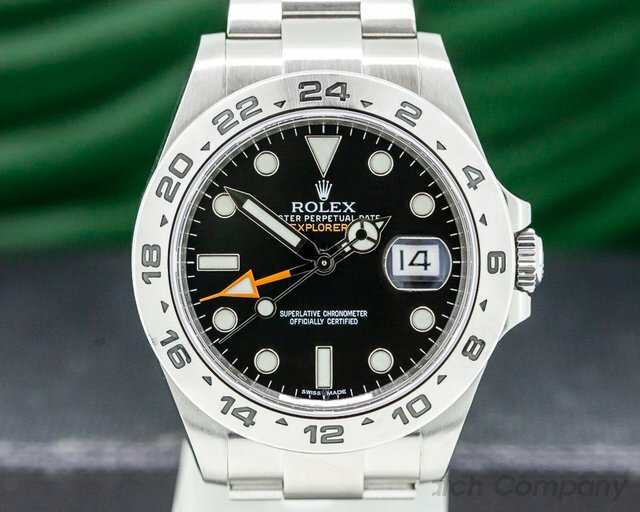 stainless steel on a stainless steel Oysterlock bracelet, automatic caliber 3135 movement, luminous applied hour indicators and hands, date at 3 o'clock, centered sweep seconds hand, COSC, uni-directional rotating bezel, screw down crown, helium escape valve, diameter: 43mm, thickness: 17.8mm, water resistant to 3,900 meters/12,800 feet, scrambled serial. barely worn with original box and papers dated February 16, 2016. 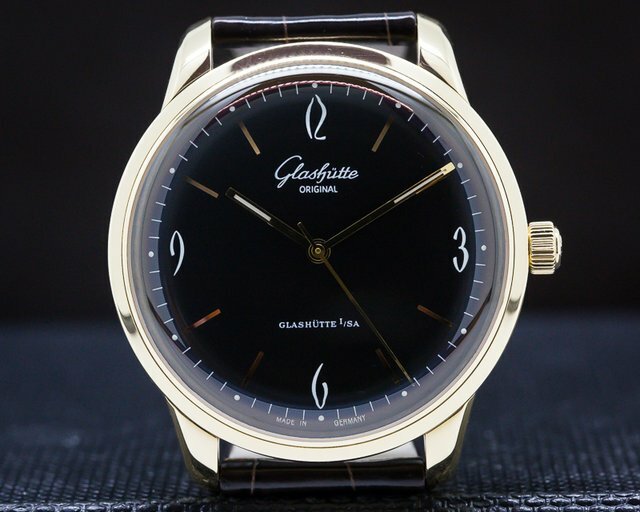 30782 Glashutte Original 39-52-02-01-04 Senator Sixties, 3952020104, 18k rose gold on a strap with an 18k rose gold tang buckle, automatic movement, constant sweep second, domed sapphire crystal with domed transparent case back, black dial with Arabic numerals and stick markers, water resistant 30 meters, Size: 39mm, Thickness 9.4mm, Like New with Glashutte box. 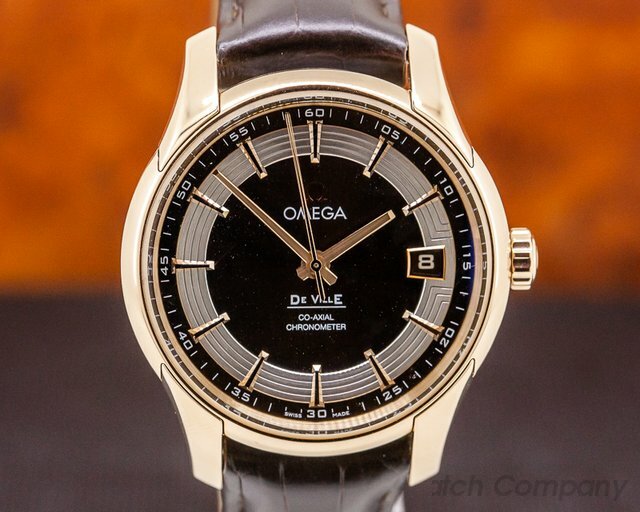 30792 Omega 431.63.41.21.13.001 DeVille Hour Vision Co-Axial Chronometer, 43163412113001, 18k on a leather strap with an 18k deployant buckle, black dial, automatic, caliber 8501, chronometer certified, date at 3 o'clock, anti-reflective sapphire crystal, exhibition caseback, exhibition "Hour Vision" window on side of case, 60-hour power reserve, water resistant to 100m, diameter: 41mm, thickness: 12.5mm. 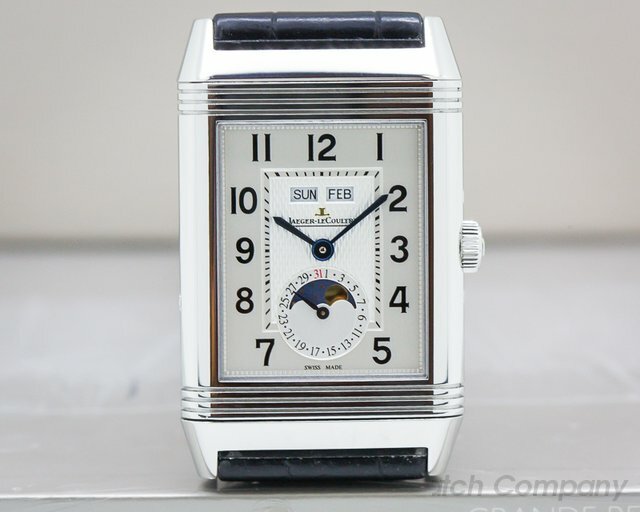 Like New with original box and papers dated February 2008. 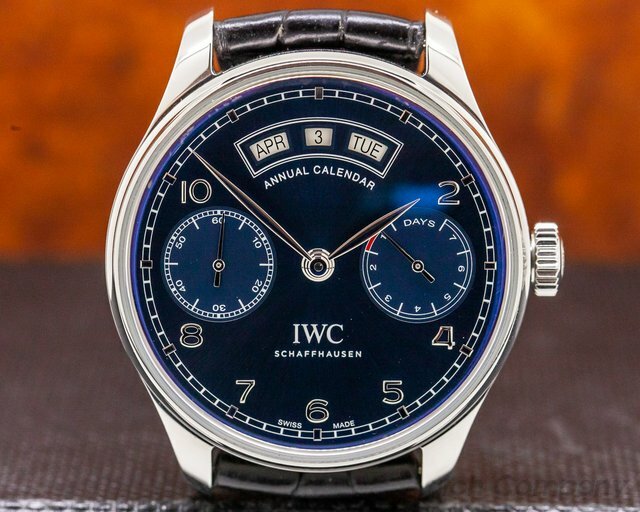 $19,500 MSRP. 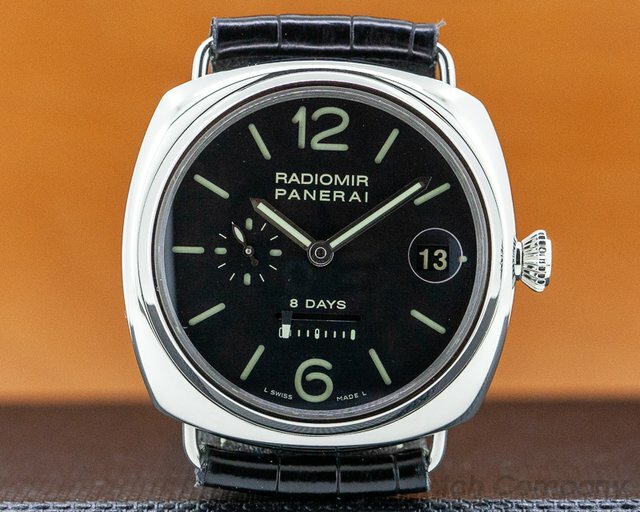 30873 Panerai PAM 721 Radiomir 3 Days Acciaio PAM 00721, stainless steel on a strap with a stainless steel tang buckle buckle, manual wind Panerai caliber P. 3000 movement, matte black sandwich dial with vintage-toned luminous hour markers, blued steel vintage style luminescent hands, 72-hour power reserve, display back, acrylic crystal, water resistant to 10 atm, T Series (2018), diameter: 47mm, thickness: 15.5mm, limited edition to 1000 pieces. 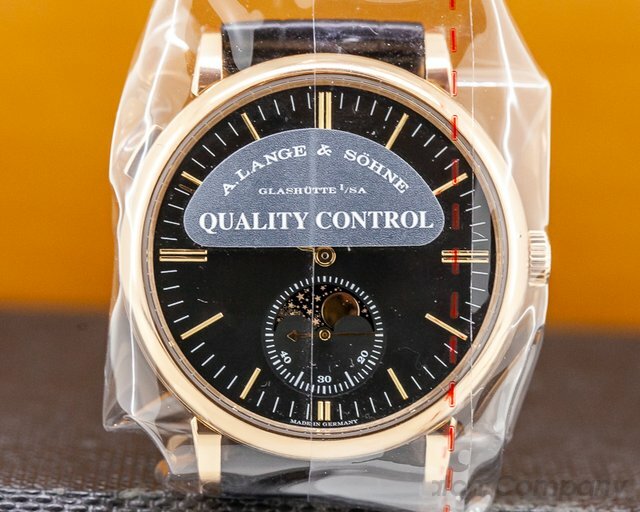 Like new with box and papers dated 6/2018. 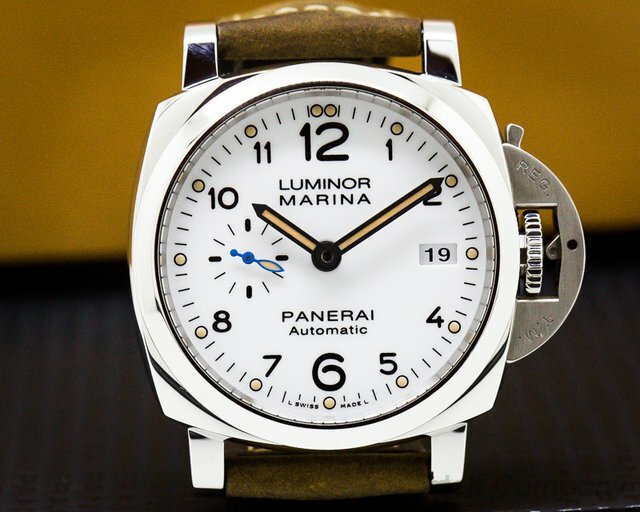 31159 Panerai PAM 1523 Luminor Marina 1950 3 Days Automatic, PAM01523, limited edition of 1500 pieces, stainless steel on a strap with a stainless steel tang buckle, automatic Panerai caliber P.9000, white dial with luminous hour markers and black Arabic numerals, luminous hands, date at 3 o'clock, sub seconds at 9 o'clock, sapphire crystal, S Series (2016), water resistant to 100 meters, diameter: 42MM, thickness: 16MM. 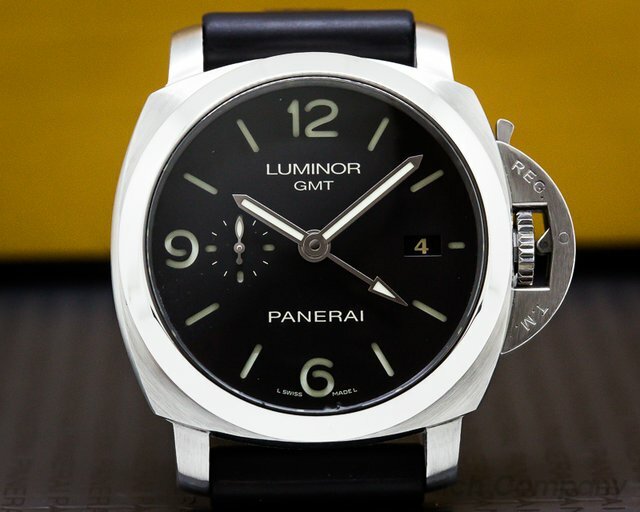 Like new with original box, additional rubber strap, and papers which are dated August of 2018. 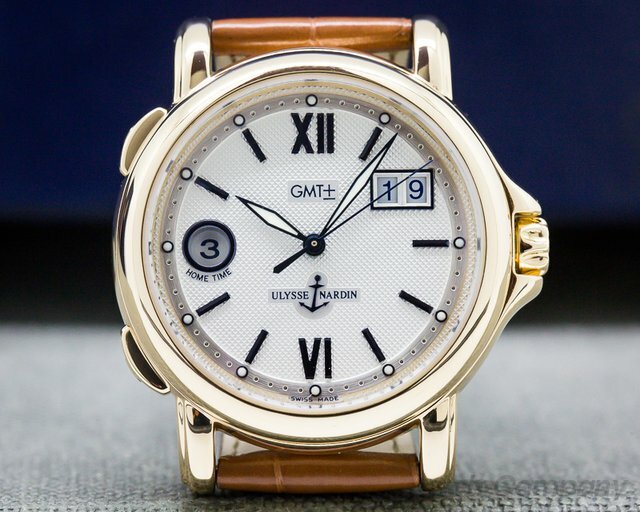 30932 Ulysse Nardin, San Marco GMT +/- Big Date, Reference 226-87, 18K yellow gold on a strap with an 18K yellow gold deployant buckle, automatic movement, centered sweep seconds hand, big date window at 2 O'Clock, home time zone (24 Hour Indicator) at 9 O'Clock, silver guilloche dial, luminescent hands hour indicators, diameter: 39mm, thickness: 12.2m, sapphire crystal, water resistant to 10 atm, Like New Condition with European Watch Box and European Watch Co. Warranty Card. 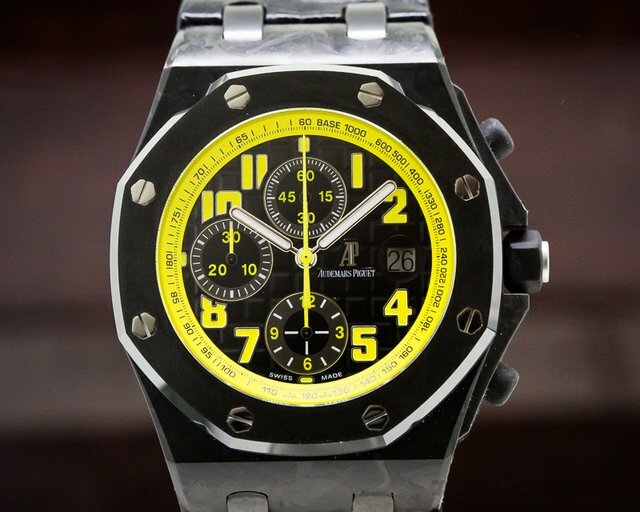 31208 Audemars Piguet 26176FO.OO.D101CR.02 Royal Oak Offshore "Bumblebee" Chronograph, 26176FOOOD101CR02, forged carbon case with a ceramic bezel on a strap, deployant buckle, automatic AP caliber 3126/3840, 12-hour chronograph, black tapisserie dial with yellow luminous Arabic numerals and a yellow tachymeter scale, luminous hands, date window at 3 O'clock, sapphire crystal, water resistant to 10 atm, diameter: 42mm, thickness: 15mm, Like New with Original Box and Papers; dated June 2013. 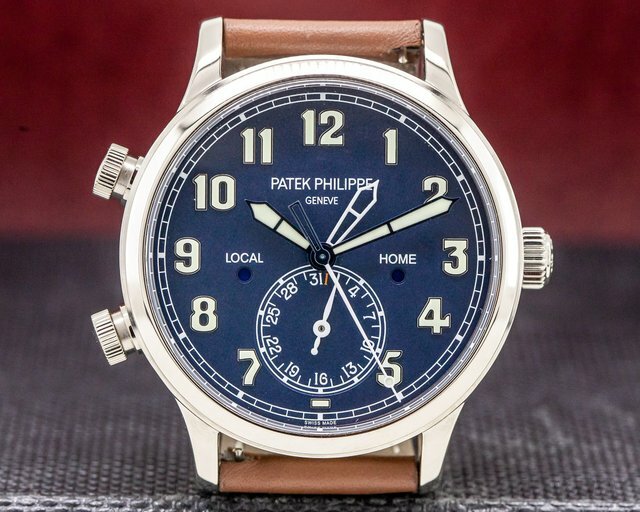 30442 Patek Philippe 5153 G Calatrava Automatic Officer's case 5153G-001, 5153G001, 18k white gold on a strap with an 18k white gold deployant buckle, automatic Patek Philippe caliber 324 SC, 45 hour power reserve, central sweep seconds hand, date at 3 o'clock, black dial with a hand finished guilloched center and applied white gold hour markers, half hunter "officer's" style case, diameter: 38mm, thickness: 9.8mm, water resistant to 30 Meters, Like new with box and papers; dated 5/2015. 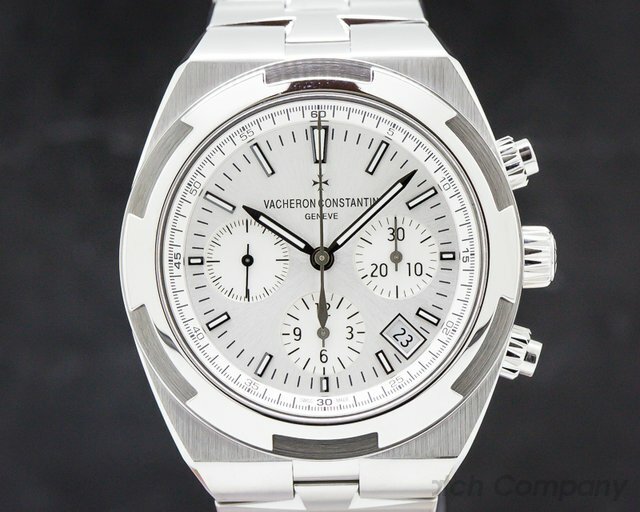 31221 Vacheron & Constantin 49150 Overseas Chronograph 49150/B01A-9095 49150B01A9095, stainless steel on a stainless steel bracelet, automatic antimagnetic VC caliber 1137 movement, 12-hour chronograph, silver textured dial with luminous hands & Hour markers, big date at 12 o'clock, small seconds at 6 o'clock sapphire crystal, water resistant to 150 meters, diameter: 42 mm, thickness: 12.5 mm, Like New with Original Box and Papers; dated 10/2016. 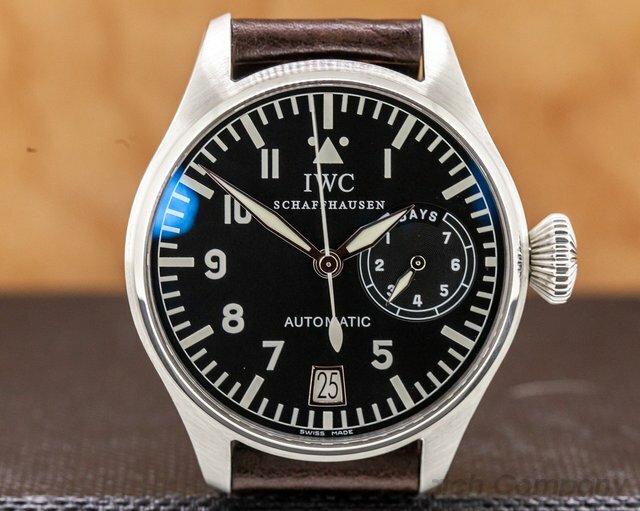 31230 IWC 5002 Big Pilot, 5002-01 or IW500201, stainless steel on a strap with a stainless steel deployant buckle, automatic movement, 7-day power reserve, black dial with luminescent hands, hour indicators/Arabic numerals, power reserve indicator at 3, date at 6, centered sweep seconds hand, diameter: 46mm, thickness: 16mm, sapphire crystal, water resistant. Like New with original box and papers dated January of 2006. 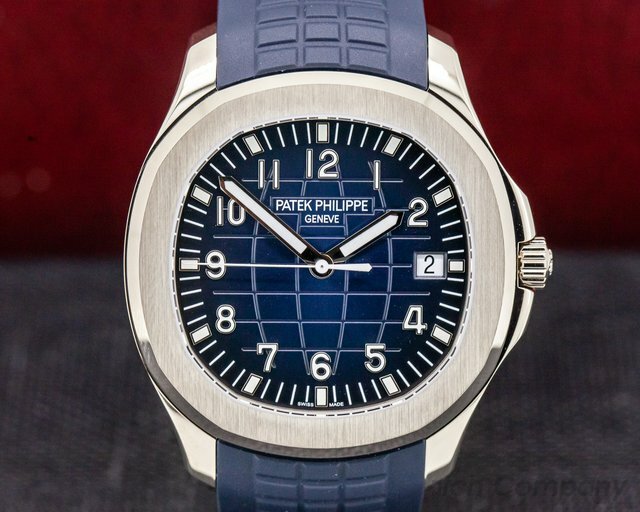 31273 Patek Philippe 5168 G Aquanaut UNWORN, 5168G-001, 5168G001, 18K white gold on a blue tropical rubber strap with a double fold white gold buckle, automatic Patek Philippe caliber 324 S C, date at 3 o'clock, centered sweep second, blue tropical dial, luminescent hands and hour indicators, diameter: 42mm, thickness: 8.8mm, display back, water resistant. Unworn with original box, hang tags, and papers dated March 2019. 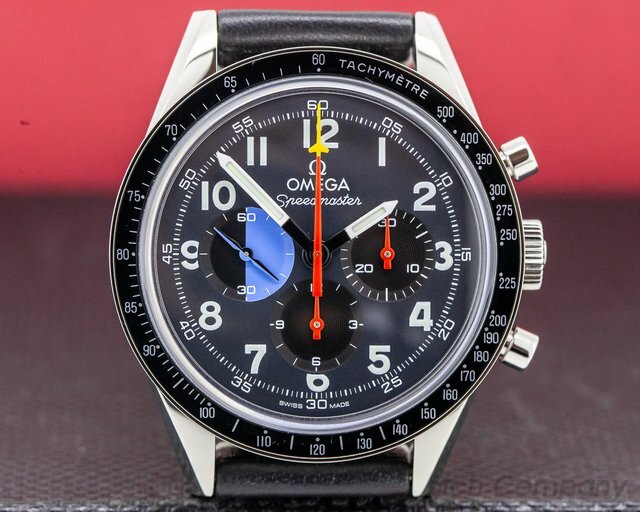 31280 Omega 311.32.40.30.06.001 Speedmaster 10th HODINKEE 10th Anniversary Limited Edition 31132403006001, released in 2018 and limited to 500 pieces for Hodinkee's 10th anniversary, stainless steel on a leather strap with a stainless steel tang buckle, manual wind Omega Caliber 1861 movement, 48-hour power reserve, 12-hour chronograph, grey dial with luminous Arabic numeral hour markers, black contrasting sub-dials, luminous hands, red chronograph hands with yellow airplane tip, blue and black running seconds sub-dial, water resistant to 100 meters, diameter: 39.7mm, thickness: 12.5mm, like new with original Box, strap change tool, additional nato strap, booklets, and papers; dated January 2019. 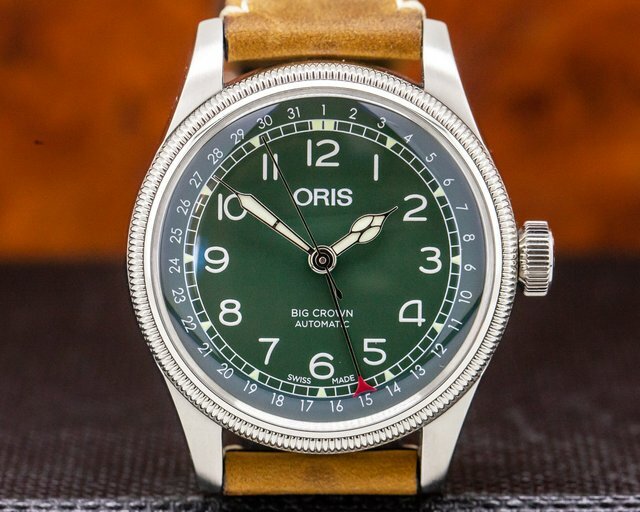 31283 Oris Big Crown D.26 286 HB-RAG Limited edition, 01 754 7741 4087-LS, 0175477414087, stainless steel on a strap with a stainless steel buckle, automatic movement, green dial, white luminescent arabic numerals, luminescent hands, centralized sweep seconds hand, centralized pointer date with red aperture indicating date, domed sapphire crystal, water resistant to 50 meters, diameter: 40mm, thickness: 13.4mm, Like New with original box and special watch roll, additional leather strap, and papers dated July 2018.